Today’s the start of that exodus, I think. 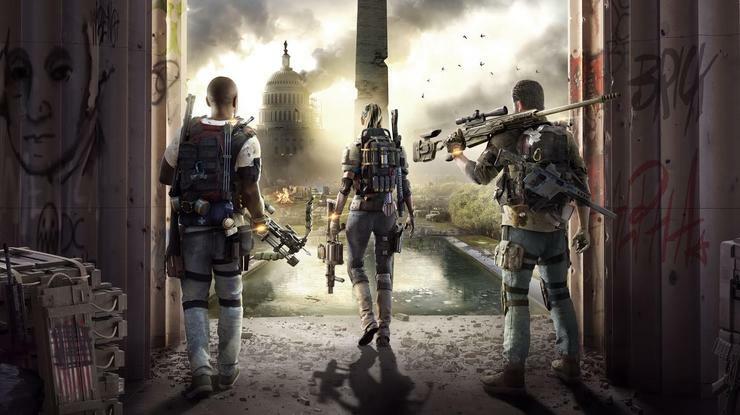 This morning we got news that Ubisoft will release The Division 2 on the Epic Games Store in March. The press release is pretty standard fare. Preorders open through the Epic Games Store today, random executives are “thrilled,” and so on and so forth. But what’s notable isn’t so much the content of the press release as much as what Ubisoft’s left out—and danced around, as well. We reached out to Ubisoft multiple times for comment, but nobody (as of time of writing) would go on-record to say “The Division 2 isn’t coming to Steam.” Nevertheless, that appears to be the case. There are two hints. First and foremost, Ubisoft’s silence on the matter. At best, I’d say we’re in for a few months of Epic Games Store exclusivity, then Ubisoft takes a look at the sales and decides whether to bring it to Steam or not. That’s the same tactic CD Projekt recently used with Thronebreaker: The Witcher Tales, eventually releasing on Steam when GOG.com sales didn’t live up to expectations. It’s also what I hypothesized Bethesda might do with Fallout 76, before a) the Epic Games Store was announced and b) Fallout 76 had its disastrous launch. Again, it’s a statement that’s not so much notable for its content as its omissions. There’s no mention of Steam, regarding either pre-orders or in that “upon launch” section. Ubisoft hasn’t come right out and said “We’re not releasing on Steam,” but...it pretty much did. Like some other Epic Games Store exclusives (see: Ashen), it appears Valve hasn’t received the news yet. 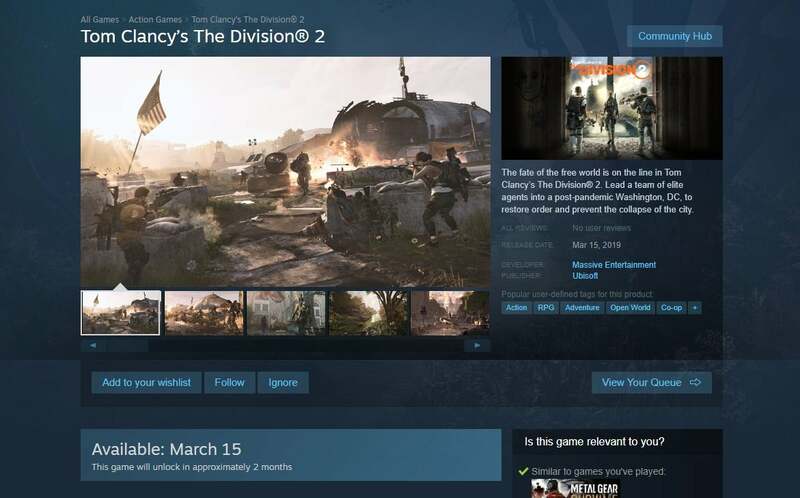 As I write this, The Division 2 still has a Steam page, and that Steam page still says “This game will unlock in approximately 2 months.” Will it? Maybe. Anything’s possible. Oof, similar to Metal Gear Survive? Maybe that low-key burn is the reason Ubisoft got mad at Valve. But it seems likely that this is the first major crack in the wall, post-Epic Games Store announcement. Ubisoft’s press release even says, “Epic and Ubisoft will work to integrate key components of Ubisoft’s Uplay ecosystem and Epic’s online services to provide gamers from both ecosystems with more seamless social features and interoperability.” That’s a marriage Valve never would’ve allowed, and perhaps one Steam’s underlying tech couldn’t accomplish in the first place. Ubisoft doesn’t seem entirely willing to make the break yet. Far Cry: New Dawn is available for preorder through Steam, as is Anno 1800. No sense diving into the deep end if the deep end turns out to be a mirage. The Division 2 is Ubisoft’s toe in the water though, and I’d bet if it sells well enough then come next holiday release season there’s an Yves Guillemot-shaped hole in Valve’s lineup. I’d also bet there are more cracks to come. There aren’t many other massive releases this spring I could see making the jump, but Mortal Kombat XI and Rage 2 both seem like distinct possibilities. Hell, Rage 2 is only available through Bethesda.net as things stand—I’m sure Epic would love to woo them over. Valve better come up with a way to sweet-talk these developers soon, or it might be too late. The Epic Games Store isn’t my favorite experience. It’s not the easiest storefront to browse, and it lacks a bunch of features I take for granted. But I go where the games go. As I said, Epic doesn’t need to convince me or you, it only needs to convince developers—and it’s doing a damn good job on that front.